When the new Subaru Forester goes on sale in the UK in May 2013, it will be the fourth-generation of the SUV and looks set to become the Japanese brand’s most popular model. 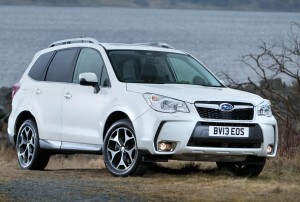 Last year, the Forester accounted for 170,000 sales globally – 27% of Subaru’s total sales – with 15,000 sold in Europe. Since the Subaru Forester was introduced in 1997, European sales have increased eightfold. Potential buyers of the Subaru Forester will find it has a high and commanding driving position; generous interior space and cargo capacity and high ground clearance. The All-Wheel Drive provides the all-terrain capabilities that the Subaru Forester is renowned for. The main difference between this and the outgoing model is that Subaru’s engineers have been able to increase the size of the cabin in the new Subaru Forester by expanding the wheelbase and widening the vehicle’s body, while cargo capacity in the new model has also been increased, continuing the vehicle’s tradition for maximum practicality. The Subaru Forester was recently awarded the full five-star Euro NCAP crash safety rating. In addition, the Subaru Forester’s electronic stability control system has been upgraded and there’s also a new Trailer Stability Control to help improve safety. There’s a lot of safety equipment fitted as standard in the Subaru Forester including twin front, side, curtain and knee airbags. The Subaru Forester will have three 2.0-litre horizontally-opposed four-cylinder engines to choose from – a 150ps naturally-aspirated petrol engine and a 147ps turbocharged diesel unit, as well as a new FA20 DIT direct injection turbocharged petrol unit, which produces 240ps. All Subaru Forester buyers will have the peace-of-mind of a five-year, 100,000 mile warranty, plus a 12-year anti-corrosion guarantee. Prices for the 2013 Subaru Forester are increased marginally over the outgoing model, despite the greatly increased levels of standard equipment and technology with the most affordable model in the range, the 2.0D X, starting at £24,995 on the road. The range-topping 2.0i XT is £30,995. The new Subaru Forester is on sale from May 1 2013 (though it wouldn’t hurt to check out how much the leasing costs compare to actually buying one). This entry was posted in 4X4 Car, Car Leasing, Cars, Manufacturer News, New Cars, News and Views and tagged caption, electronic stability control, Euro NCAP, Europe, Forester, fourth generation, interior space, lease the Subaru Forester, subaru, Subaru Forester, SUV, technology, Trailer Stability Control, UK by Steve Lumley. Bookmark the permalink.